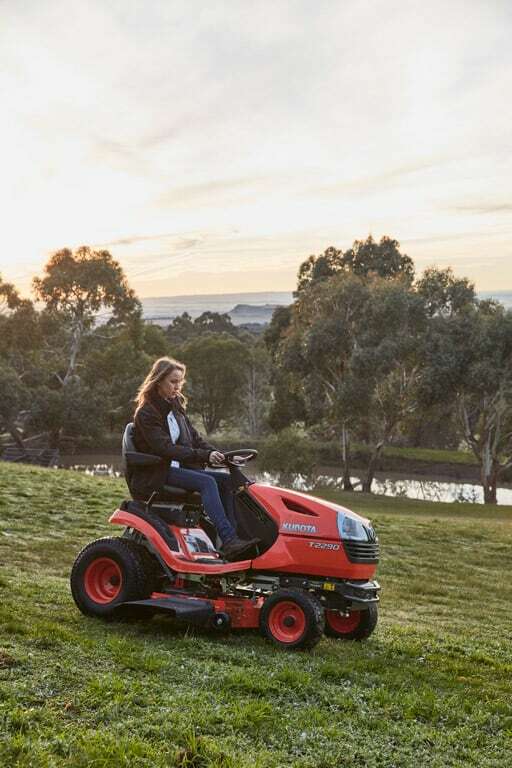 The Kubota T Series lawn tractor range combines powerful performance, efficiency and comfort, creating perfectly manicured lawns without the fuss. 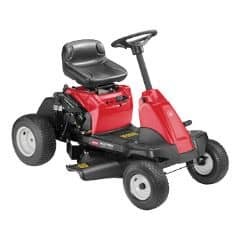 Built with fabricated mower decks, a durable tubular frame structure, and cast iron front axle for years of dependable work. Powered by 20 and 22HP petrol engines and hydrostatic transmissions, the Kubota T Series makes even the biggest jobs effortless. Rugged and dependable petrol engines have plenty of power to get you up the hill without stalling. Both the T2090 and T2290 have powerful 2-cylinder V-twin engines. Hydrostatic transmissions make operation easy and precise. A single pedal controls speed and direction changes quickly, without shifting or clutching. This system keeps your hands free for precise steering at all times, especially when working in confined spaces. Cruise control feature allows you to maintain a constant mowing speed without having to hold down the speed control pedal. 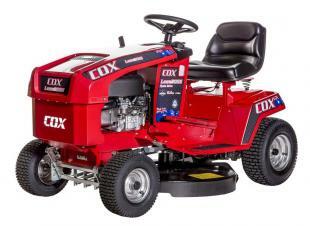 Just 14″ is all you need to turn a T Series lawn tractor. This best in class turning radius is very handy when maneuvering around posts, garden beds, and other hard to mow-around objects. Cast from ductile cast iron, the T Series strong and durable front axle easily handles bumps and shocks of mowing jobs to ensure a long and dependable service life. A tubular-frame structure enhances the T series already exceptional durability, rigidity, and strength. 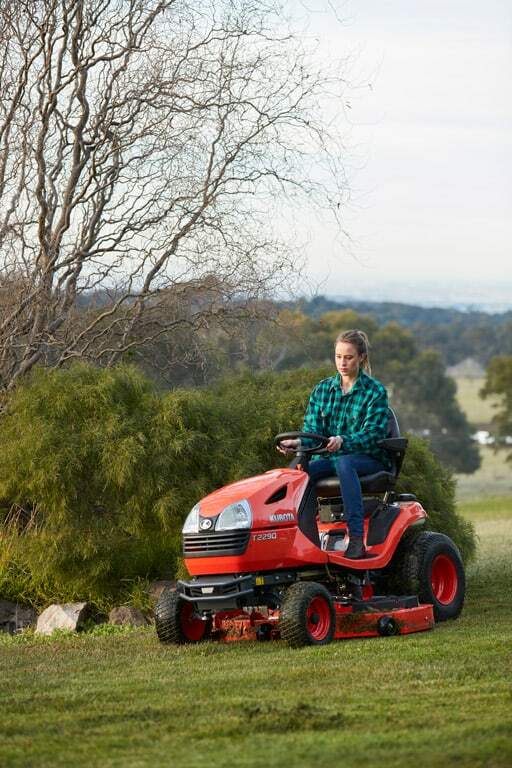 Even under tough terrain conditions—irregular lawn layouts, or steep slopes, your T series lawn tractor will continue to provide years of dependable service. 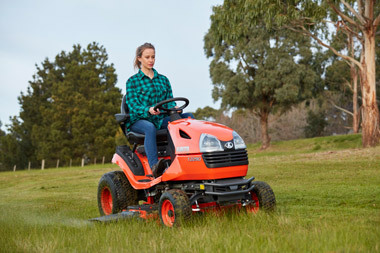 Built with Kubota’s reputation for quality, fabricated mower decks are featured on T Series’ mowers providing excellent rigidity and strength for years of trouble-free operation, reduced maintenance and dependable service. An optional mulching kit can be fitted to convert the mower deck into a high-precision mulching deck that produces a fine mulch and sends it straight back into the turf. 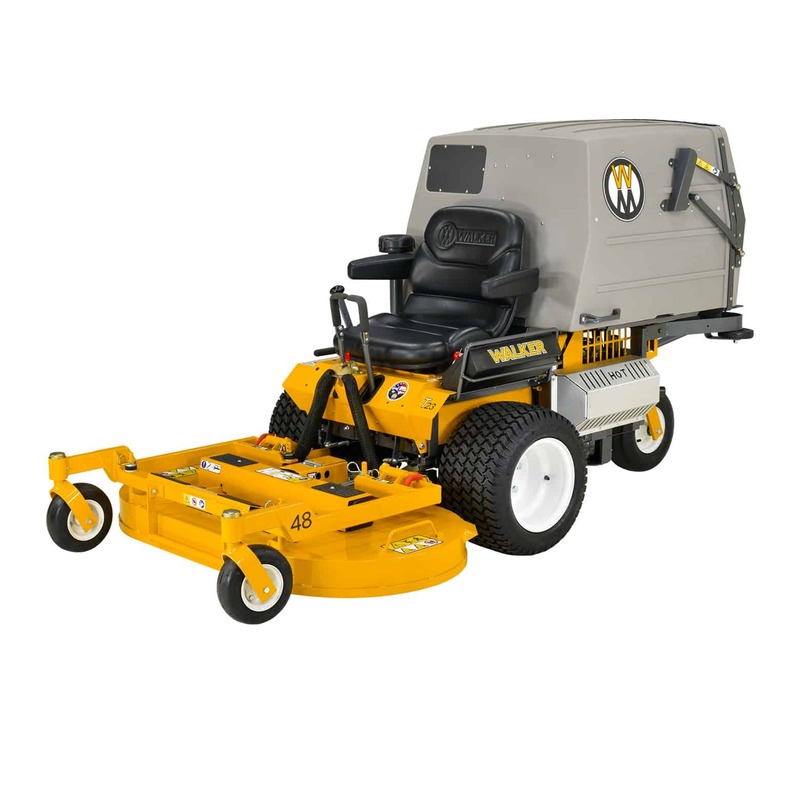 Two sized mower decks are available, 42″ for easy access into tight areas, or 48″ for a wider cutting width. Optional grass catchers are available. 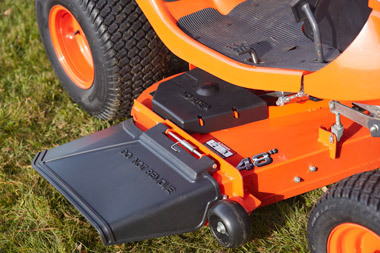 Due to the powerful flow of the fabricated mower deck, a blower is not needed—the deck does all the work. With this design, attaching the grass catcher is simple, making it easier to switch between grass catching and discharging. 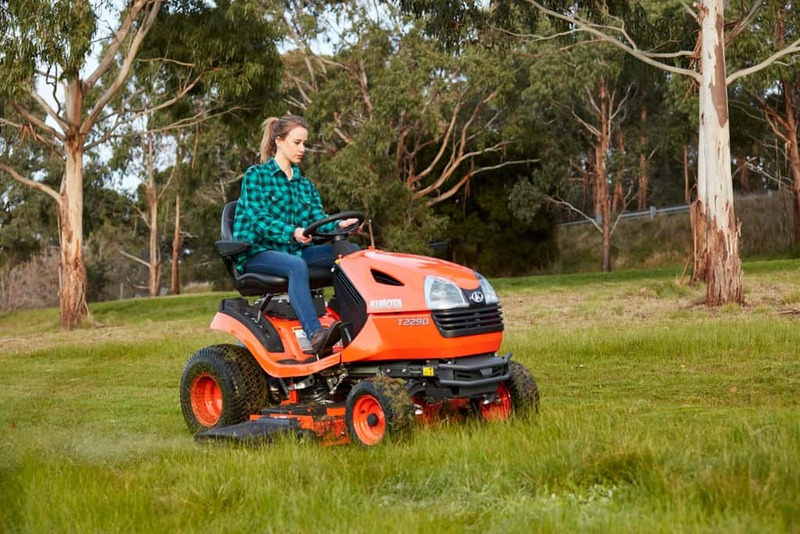 Adjust the mower decks cutting height easily with Kubota’s simple dial type design, that’s ergonomically positioned on the right hand fender. Simply turn the control dial to your desired cutting height. 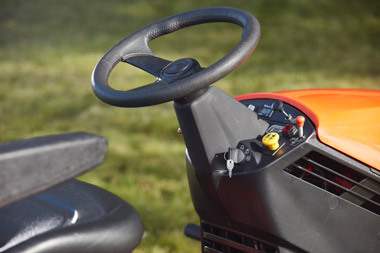 The lift lever releases the mower deck easily to raise or lower as needed. The T Series features the flattest foot rest in its class— no bumps, no humps, nothing to get in the way of your feet and your comfort as you work. Getting on and off are easier too! Deluxe 21″ high back seat adjusts easily to accommodate different sized operators. Armrest are standard on T2290 models. 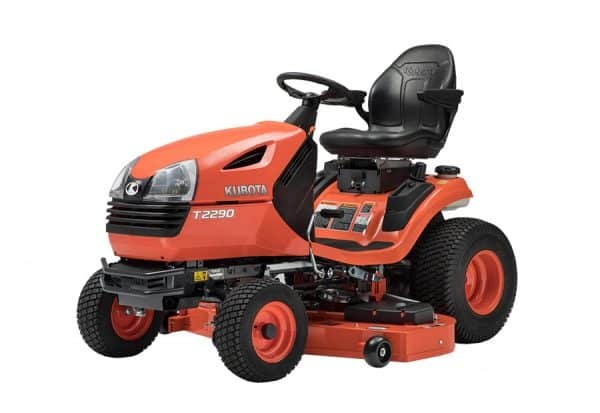 The T2290 features a high-back suspension seat with parallel link suspension that provides an even greater level of comfort and support. The seat adjusts a full 4 inches forward and back, letting you find just the right seating position. A thick, easier to grip steering wheel ensures maximum control and ease of operation while reducing vibrations. The steering wheel is positioned higher to enhance operator comfort and control.